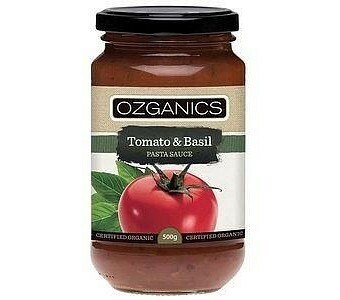 Ozganics rich pasta sauces are created from the freshest organic ingredients. Slow cooked in the traditional style, Ozganics pasta sauces have a robust and hearty flavour. These are some of Australia?s most popular organic pasta sauces. Enjoy the rich combination of fresh garden basil, herbs and tomatoes, simmered and stirred to perfect consistency, with your favourite pasta. Ingredients: Organic tomatoes 96% (reconstituted tomato puree, dicedtomatoes), certified organic sugar, sea salt, certified organic garlic, certified organic basil (0.5%), certified organic herbs & spices, lemon juice, food acid (citric).